If you’re looking for some last minute (ish) ideas for holiday gifts, here’s another option worth considering – gift someone an iBook, right from your iPad. Apple has recently enabled the gifting feature in iBooks on iOS – so it’s easy to do with just a few taps. 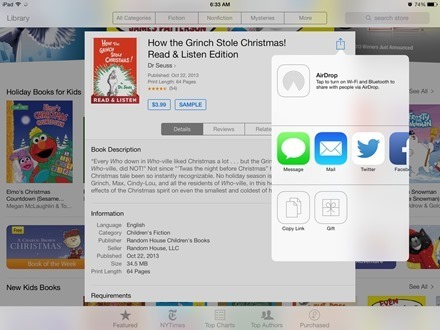 Gifting an iBook works just like gifting an app. Once you’ve got a selected iBook open, you tap on the Share button at the top right of the book’s info page – and then tap the Gift button. From there you enter the recipient’s email, any message you want to add, and select whether to send Today or on another date, pick a design for the gift notification, and make your purchase. A nice way to share the gift of reading on an iPad – hopefully along with some great printed books as well.